Sold by Lexington Park and Fulfilled by Amazon. Gift-wrap available. We're living in the midst of a scientific revolution that's captured the general public's attention and imagination. The aim of this new revolution is to develop a theory of everything -- a set of laws of physics that will explain all that can be explained, ranging from the tiniest subatomic particle to the universe as a whole. Here, readers will learn the ideas behind the theories, and their effects upon our world, our civilization, and ourselves. Sold by Lexington Park and ships from Amazon Fulfillment. 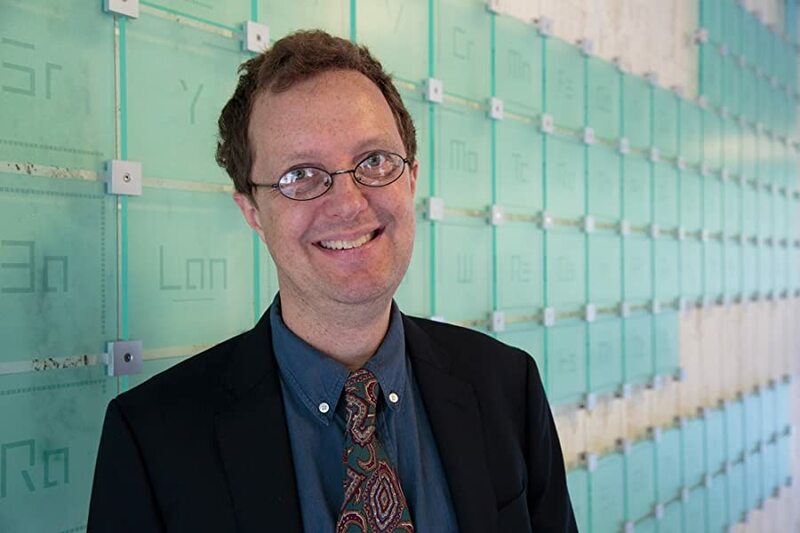 George Musser is a staff editor and writer for Scientific American magazine. He was recently awarded the 2010 Jonathan Eberhart Planetary Sciences Journalism Award by the American Astronomical Society. He was the originator and one of the lead editors for the magazine's special issue "A Matter of Time" (Sept. 2002), which won a National Magazine Award for editorial excellence, and he coordinated the single-topic issue "Crossroads for Planet Earth" (Sept. 2005), which won a Global Media Award from the Population Institute and was a National Magazine Award finalist. Start reading The Complete Idiot's Guide to String Theory on your Kindle in under a minute. 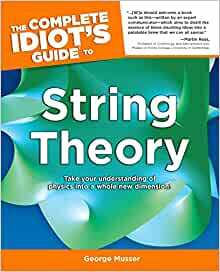 In this book, George Musser has made an attempt to introduce the concept of string theory to the masses; however, I don't think this "idiot's guide" really accomplishes that goal. Musser covers a wide range of topics in twenty-three bite size chapters of about ten to twelve pages each. I have found in chapter after chapter that the discussion is too superficial to really grasp the concepts discussed. If you think of the vast knowledge of this subject matter as being a large pond, this book will simply give you bits and pieces of information like a rock skimming across the surface of the pond. If you had no prior knowledge of the subject matter, I just think you would walk away with not much more that a smattering of facts and information, but no real depth of understanding. Of course, to be fair, this is a difficult subject to "translate" into the common vernacular so to speak, but I know some justice can be done to this feat. I know because I have read the books written by Brian Greene on the subject. For example, Green's book "The Elegant Universe" did a splendid job of presenting the concepts of string theory and the cosmos in a manner that allowed comprehension by the non-expert. Nevertheless, in his book, Musser touches on many subjects, such as relativity, quantum theory and the world of the small, the Standard Model, black holes, the big bang, time travel, gravitons, strings, loop quantum gravity, extra dimensions, parallel universes, symmetry, branes, testing string theory, and more. New terms introduced are defined in sidebars as are explanations of key ideas and concepts albeit tersely. If you can be content by a collection of "fast facts" on this subject matter, you will probably find this book satisfying. 5.0 out of 5 starsI'm glad I stumbled onto this book in the local library and had to buy my own copy. Take my time, get through this. I confess I'm still slogging through the first half. So much new Information. A very good feature, is how this writer refers you to other parts of the book both material already covered and material in later chapters. I really appreciate the short glossary in Appendix A which I usually ignored in the past. Also some good follow up info in Appendix B. Especially the information about Cosmology. This author also maintains a web site for errata plus some more resource links. When I finish George Musser's book I think I'll be prepared enough to tackle Brian Greene's "The Elegant Universe" next. Maybe even dig out my old Hawkings book that I never finished. The problem is I am not only a complete idiot but an under educated one too. I took math and physics at school and did OK but that was years ago. Never the less I am persevering because it is a fascinating subject and the book is well written. I am always skeptical of physics for laypeople that avoids all the math. The math of string theory, however, is for experts only. Musser does a great job of explaining the lay of the land. He does not only string theory, but all the background needed to make sense of string theory. I do think string theory is seriously overhyped. It makes no testable predictions (as of yet). Mostly the explanations are reasonably well written. However, it's not true for all the explanations given in the book, at least not for me. That is, when I have to re-read some explanation three times and still feeling unsure of the answer given in the book, I just have to move on. This is a beautiful book, not only in its clarity but in its proper understanding that quanta are primary over particles. Yet it still tries to sell you on the idea that strings are physical, just as 19th century science tried to sell us on the concept that mind is physical. But, to get back to the controlling metaphor, IMHO just as we have minds, and our minds are primary (controlling) over our bodies, particles are controlled by quanta. Scientists so far have mixed the metaphor and have not been able to understand that quanta control particles, condemning strings to the physical world of the particle. So like Ponce de Leon, and his search for the fanciful fountain of youth, it seeks some fanciful solution to the "extra dimensions" necessary to explain particle activity in physical, rather than naturally in mental space. But in fact the "extra" dimensions are not hidden or curled up in physical dimensions, the extra dimensions, like all quanta, are mental and the extra, controlling dimensions are mental as well. 5.0 out of 5 starsThe guide to string theory for the educated non-specialist. Use of the word Idiot is just an attention-grabber of course. The author leads you with minimum difficulty to a satisfying basic knowledge of strings, if you are a pretty intelligent and educated person. If the theory can be verified by experiment, our knowledge of how the world works will be greatly advanced. Crazy read. I did not know that String Theory was thought up from some 8 year old kid back in ancient Ireland.